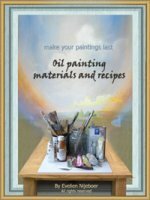 Pastel techniques can give an ethereal look and gradient transitions - much like watercolors, but soft pastels are much easier to handle - you don't have to wet your paper. You can use them over a dry watercolor painting, if you like. Further down you'll find some tips on papers, fixation and other tools. Soft pastels don't have a big reputation like oils or watercolors, because they're relatively easy to work with. But no one should deny onself the pleasure of soft pastels. They give translucent colors and easy blending, but on dry material (paper) that can be erased (watercolors are much more difficult in that!). 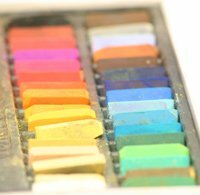 Soft pastels are made of almost only pigment. On the right paper (and with some precaution) you apply them loose, and if you don't rub hard you can move them around untill you like what you see. Fixing is done afterwards, with a spray-on fixative (or hairspray). With soft pastels, you can make quick notation of ideas and still work in a painterly way. Of course more elaborate work is possible too. the material tends to get a soft look, a bit like Renoir (scroll down). For making dark, saturated colors: fix it inbetween. Too much rubbing causes loose pigment on your paper. If the paper no longer absorbs any pigment (and you want to apply more), use fixation - which can be either Lascaux Fixation Medium, or ultrastrong hair spray. You can work with make-up brushes, your fingers, tissue, cloths, or a little cotton wool. A kneaded putty can be used for erasing hard lines or taking up pigments. Talcum baby powder and cotton wool can make the colors softer. To avoid your first strokes firmly setting deep into your paper, powder your paper lightly with talcum baby powder. All the above goes for applying pastels over water, except for the talcum powder - baby powder on watercolor paintings won't look good. Better use white pastels. The softer you pastels, the less they scratch into your paper, and the easier you can make gradient transitions with them. The softer the pastels, the less binder they have - making dark colors may need some in-between fixation. Rubbing the crayon harder to the paper will mainly cause more loose powder. The softer your pastels, the dirtier it gets - the pigment powder goes everywhere. Protect your clothes and table. If you can - keep one finger for each color. The softer the pastels, the easier they break - get a good casquet to keep them good. If they break - no problem, you can still make powder of it. But it's nice to have them clean. Softness means, the pastel looses its pigment in powderform quickly. As soon as that happens: use your fingers or cotton wool to rub it in your paper. Too much loose powder makes traces, when you blow it off the paper. Do some fixating on the first layer, after that you can make the color darker. Fixing can be done with Lascaux fixing medium, or some ultra-strong hair spray. Initally, all paper is good (as long as it's not shiny), but Ingres (the french impressionist) put in some effort and developed a special pastel paper - which is still being produced and named "Ingres" ( Check here at blick.com) . Great paper, especially developed for pastel techniques by Ingres himself. If you hush the pastels over, they won't get stuck right away - but they do when you push the colors in, with your fingers or a cloth. Still they can be erased with a puttty. Pastel painting can be done in layers, just like watercolors. If you don't want the strokes or powder to get stuck right away, wave some talcum powder (baby powder) over your paper first. Hahnemuhle also sells Ingres paper, in a smaller size on pads. Colored paper can make a great start - and good news: Ingres is available in many colors. Earth colors are great for setting a general mood for realistic work - Check this page on imprimature colors, for more info on the function of earth and underpainting colors. Throughout the years I've used Unison, Sennelier, Schmincke, Rembrandt and Canson - it's always a choice between color and price. I defenitely prefer the first three brands though. I put them in order: Unison and Sennelier are the softest, and Canson the hardest. You take pastels for softness - for painting hard lines it's better to take ink or watercolor. Softness really is an asset for pastel techniques - hard pastels scratch into your paper and are difficult to scumble with. Sennelier Soft Pastels and Unison Handmade Pastels are the finest (and most expensive) quality - exquisite, bright colors and really soft, fine pigments. They're both handmade. The original Sennelier store is in Paris. Schmincke Soft Pastels are a very good quality too. Their cobalt blue light is unique and very good as a sky-color. Rembrandt Soft Pastels are cheaper and more sturdy - if you first grind them to powder, you can still use them for blending. You can also make your own pastels, and make them as soft as you like. Scroll down for recipes. Some colors seem to be difficult, like a good carmine or burgundy. They easily get too yellow or too dirty/heavy. Another thing: most pastel colors come in shades - white was added to get those. No need to get all the shades: you can mix them yourself, either on your paper or on the printing sheet. Just the darkest shades will do. One vital thing about soft pastels: you need a good case to protect them, like a cassette with a foam inlayment, in which every color has its fixed place so they won't get dirty. If you take them anywhere: cradle them with cotton wool so they can't move while you transport them. Soft pastels can be used on Ingres paper, but also on paper that was already watercolored on. You can also combine them with ink markers - to get a nice soft/hard line contrast. They won't get a grip on shiny paper though, unless you use a fixation spray first. After you shifted from watercolor to dry pastels on one painting, don't let the paper get wet again. It will make the pigments float around and no one can predict where they'll go. This can be done with dry pigments and a traganth-gum solution. 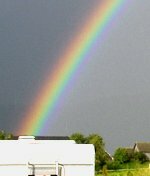 The pigments can be ordered at Blicks (check Gamblin Dry Pigments or Sennelier's , for the gum it's best to turn to Paintmill de Kat, where the traganth gum can be ordered online (it can be sent overseas). Add 10 grams of traganth-powder to 1 liter of water and let it rest overnight. Also add a teaspoon of natrium-benzoate (for preservation). This gumwater is added to dry pigment powder (not too much), so that it becomes like clay, of which you form crayons. When making pastels, it's best to use a marble slate to work on, and wet the pigments until you get something like a wet clay. Roll it in your hands untill enough moisture is absorbed to make a decent clay, then shape it into a crayon and let it dry to the air, in room temperature (no ovens or hot sun, the crayons will crack).